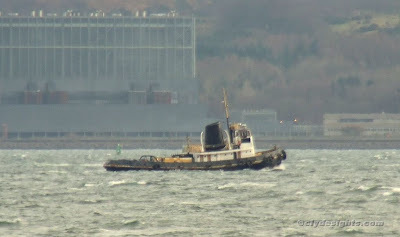 Finally taking her leave of the Clyde this afternoon, the tug ST BUDOC was seen passing Inverkip as she commenced a lengthy sea passage to Portland, in the south of England. There it is expected that she will be prepared for a new career in Africa. ST BUDOC has been a familiar sight in the Holy Loch as she lay on mooring buoys at the head of the loch for the past six years, and over the past year at the pontoons of the Holy Loch Marina.